2007 Avalanche owner! These things are fantastic! Topic: 2007 Avalanche owner! These things are fantastic! Finally my registration went through! Thanks for having me everyone. It feels good to officially be part of the family . 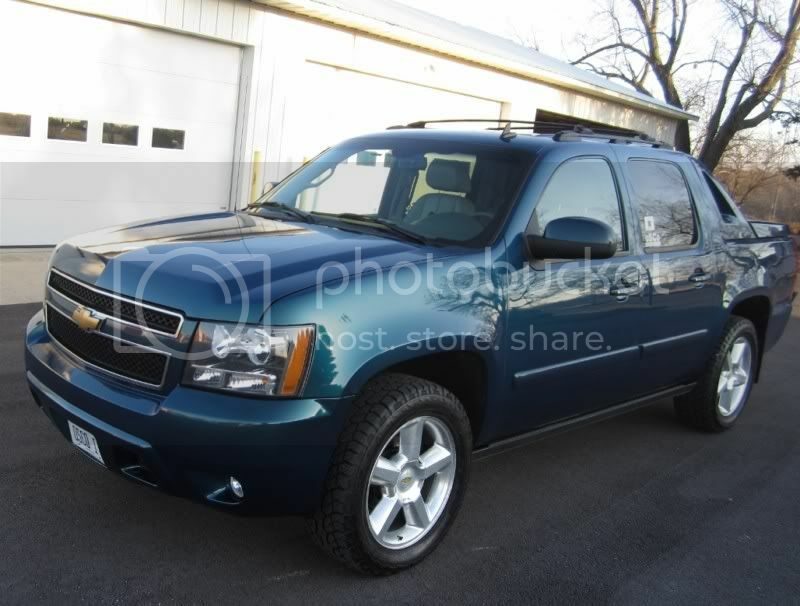 Just picked up a 2007 Bermuda Blue 6.0L LTZ smooth body Avalanche off ebay! This is really an amazing truck that no one I know owns! I wish I knew sooner how great these were. The GMT900 platform is really my favorite and to get the color I wanted and all the added upgrades that the original buyer ordered really makes this the perfect truck! Thanks for having me, and check it out! For a truck that cost nearly $50,000 5 years ago, I got a fantastic deal on ebay (first vehicle bought on ebay) . I was high bidder #3 and they sent me the 2nd chance offer . and the list goes on, and on, and on! 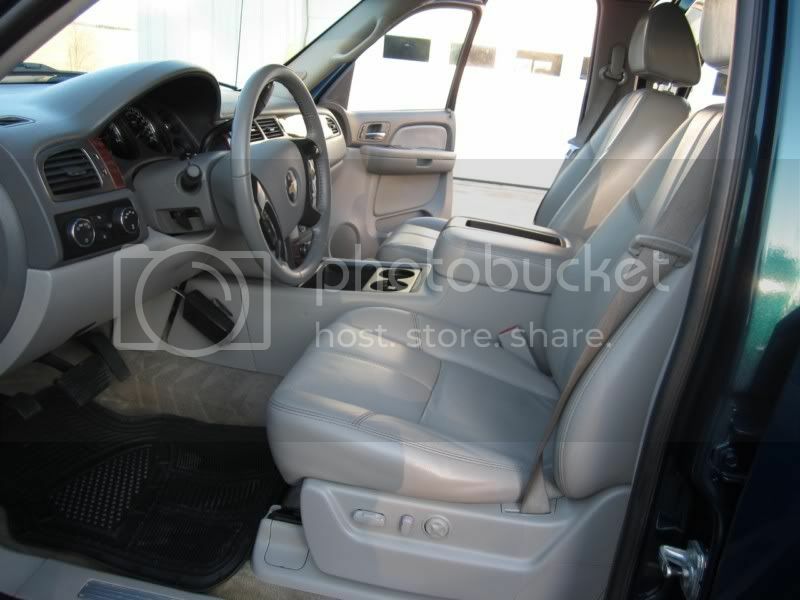 The owner ordered this truck new and had $13,000 in upgrades alone! Re: 2007 Avalanche owner! These things are fantastic! They are awesome trucks. I just got mine tooo and am happier than a pig in sh... err poop. Grats on your pick up. Very nice. Someone even painted the sail panels or added a body matched slick kit over it also. The original owner is like 55-60 yrs old and I'm wondering if the dealer talked him into having the smooth plastics done..... He did own a '03, '04, and a '05 in the past. Maybe he just got tired of the black plastic look. I'm thankful he did it because I would have wanted it done too . Is having the Bermuda Blue '07 and a 6.0L a rare-ish combo? Was the '07 the last year of bermuda blue? I just took it to the Chevrolet dealership this morning for them to fix the broken exhaust manifold bolts on the passenger side but other than that, it has been great this entire week. Had the XM for a day, loved it, and it was shut off...... Got it back on yesterday because it really is a nice feature to have. Any ideas what else I should keep an eye on because of the mileage? 130k, but runs fantastic. Just got a call from the dealership and it's great news!!! They were able to extract the two broken exhaust manifold bolts and my total with a oil change, rear diff fluid change, and a "once over" on the suspension, steering, and brakes comes to about $550. Congratz on your purchase. It looks like it is really clean and in excellent shape. I have heard about the exhaust manifold bolts snapping on some of the 07's. I have a friend that had this occur, he just tack welded a nut to the broken bolt still in the head from inside the threading of the nut, used some penetrating oil, and then wrenched it out. Welcome, nice truck and yes '07 was the last year of bermuda blue. You have a beautiful truck.You will love the ride! Yep, you got a rare truck, and a great one! That color with the 6.0 and 4.10s is pretty sweet. I will try to get on my amber DRLs so you guys know it's me trucking around . I am really in love with this thing. It feels like I stole the truck and it really isn't mine yet! . Good to see a good support system here too for this platform. Thanks for all the kind words! Very nice looking AV. I love the blue. Those white seats might be fun to keep clean but they look sharp too. I added a Volant cool air intake on my 07 and picked up 2mpg. Mine is one of the 07's that use oil. I add a quart every 1400 miles. (common on 07's) I have just turned 115,000. I love this truck. Have fun with it you'll enjoy it. I'll keep an eye on my oil level too, thanks for the TIP! My truck was like a 6/2006 build I think so it would probably have that problem with the oil like you are talking about. Yes, watch the oil. I am not sure the 6.0 has same issue but a good idea to watch. Looks like you picked up a sharp truck. I wish I could make it my daily driver but I want to keep it this nice for as long as I can. The MPGs are good enough to drive it all the time. I love it . I love my 2012 Tahoe!! That is a gorgeous Avy!! Congrats!! 2012 Chevy Tahoe, 4x4, LT. It is Graystone Metallic!! Chevy Avalanche. Like a rock. Sweet ride blu_fuz. Since GM announced the end of production for the Avalanche, you now have a classic. Put new front pads and rotors on last weekend. 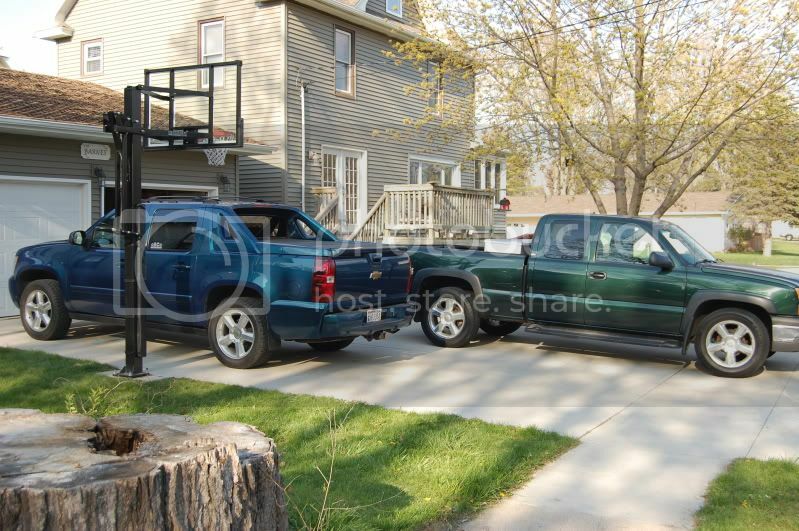 Said my fairwell to my '04 Silverado. Very Nice Sir.. Mine is white but has the same interior.. I bought mine in May of 07 with 3.2 miles on it.. 176,000 now and she drives like the day I brought her home.. Best DD vehicle I have ever owned.. Most useful, comfortable etc etc.. New alternator at 138 K I believe. The rest is maintenance stuff only.. I have always used Mobil 1 since the first change.. I add about 1/2 qt at 3,000 and change it every 6,000 so even with my miles I dont have big oil use issues.. Still on the first set of replacement brake pads.. You will love the truck more the longer you have her !! 176k on yours, that's great! I hope to take mine to 300K. these trucks rock, got my 2007 Metallic Orange(only 2007 also) two years ago(up to 55k miles). You know the AV has a full frame also. The body and bed being one piece help the ride a lot, also the coil spring suspension. 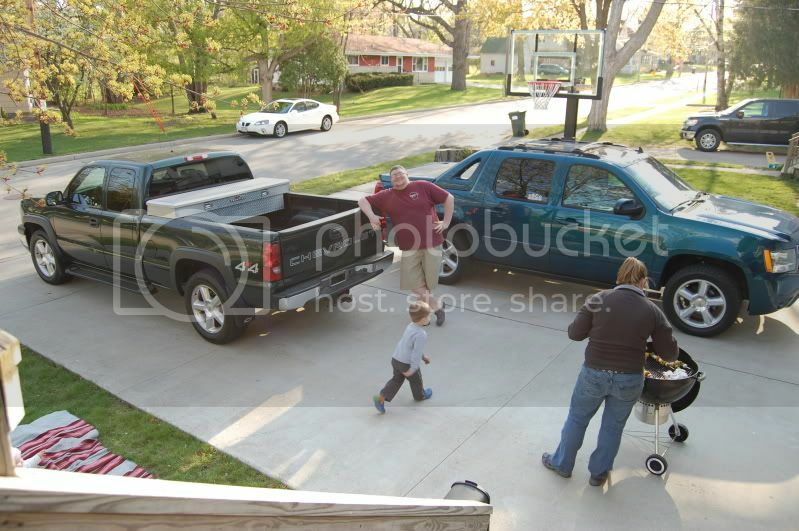 yeah but the nice thing about the AV is it doesnt have that full frame truck bounce. It feels like an SUV. 9/27/07 08 Blue Granite LTZ/ 6.0 liter with GTO emblem/4.10 Gears/Super Duty Trans with Extra Cooling/Amber's/GMPP Cold Air Kit/GM Chrome Tow Hooks/GM Chrome Exhaust Tip/GM Chrome Fuel Door/Weathertech Floorliners F+R/Color Matched Weathertech In-Channel Visors/Z71 Skid Plate Package/LTZ Chrome Console Emblem/Denali Body Side Mouldings/DiabloSportTuner with Custom SLP Tuning/Police Pursuit Wiper Arms+Blades. Cool vids with those trucks. Thanks for sharing.